Creative Live Night Photography Week! I’m excited to announce that National Parks at Night is collaborating with CreativeLive on producing “Night Photography Week” this September. And all five National Parks at Night instructors—Gabriel Biderman, Chris Nicholson, Tim Cooper, Matt Hill and myself—will be on screen to help you plan and execute awesome night photography projects and experiences. The Alabama Hills in California’s Eastern Sierra are a great location for night photography and light painting. We witnessed this awesome spectacle for over a minute. It was slow-moving (or appeared so to us), varied in intensity and color, and we could see multiple trails as pieces broke off as it descended further into the atmosphere. In addition to the pyrotechnics, Ian Norman from LonelySpeck was on-site with us, talking about his infinity focusing aid, the SharpStar2. The SS2 is based on a device used by astronomers, called a Bahtinov Mask. SharpStar uses the properties of optical diffraction to create a set of three fine spike lines around a bright star. These diffraction spikes shift position as you focus your camera; adjusting focus so the central diffraction spike sits evenly between the other two diffraction spikes ensures perfect focus. I have been following Ian’s work for the last couple of years, and have been mightily impressed by his work in the field of Astro-Landscape Photography. 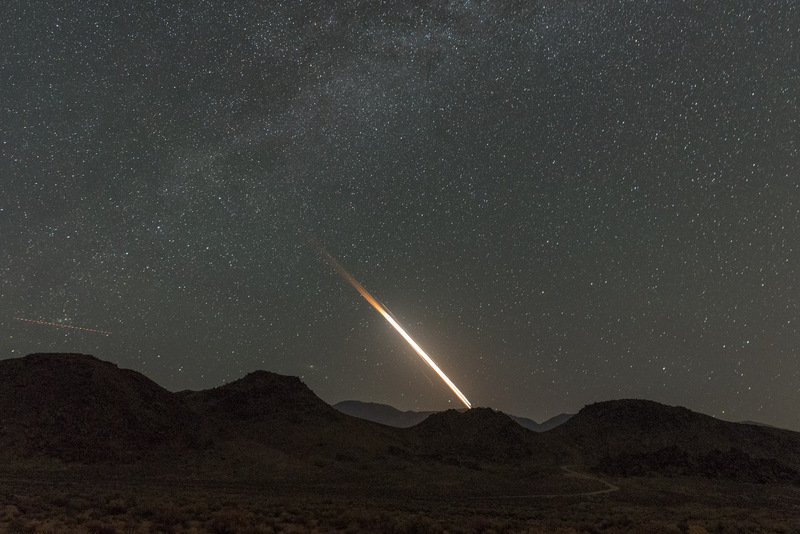 He has a huge following, and was about to lead a meetup two nights later at Trona Pinnacles where over 100 people would come together to photograph the night sky. Again, I will cover how to capture truly out-of-this-world imagery, including how to capture the Milky Way, star points, and star trails. I am thrilled to be working with NPAN and CreativeLive on what we hope will be the first of many collaborative efforts together!